Interpersonal assessment has broad appeal to the clinician interested in capturing their patient’s interpersonal dysfunction in a systematic way. The most basic approach is to evaluate the patient on an interpersonal surface (e.g. interpersonal problems) using a self-report inventory. From this data, the clinician can gather the general level of interpersonal distress (elevation), the prototypicality (R2) and distinctness of interpersonal distress (amplitude), and the theme of where the patient’s interpersonal difficulties lie (dimensional scores of agency and communion, or displacement) (Wright, Pincus, Conroy, & Hilsenroth 2009). This information could be important in treatment response and expected pitfalls (Ambwani & Hopwood, 2009; Dawood, Thomas, Wright, Hopwood, in press; Kachin, Newman, & Pincus, 2001; Salzer et al., 2010). The clinician can also gather additional reports from that same patient to compare their interpersonal features across surfaces, particularly useful in identifying where a patient’s interpersonal strengths and values are at odds (Wright & Pincus, 2011). Or the clinician can gather additional reports from other informants to evaluate agreement between self-rated interpersonal features and informant ratings of that individual’s interpersonal features (e.g. Pincus & Gurtman, 2003). Using a more complex model of the interpersonal circle (Structural Analysis of Social Behavior; Benjamin, 2000), the clinician can evaluate the patient’s internalized representations of important persons as well as the patient’s reactions and responses to such people. The majority of these methods articulated for interpersonal assessment of a single individual have been at the dispositional (time-invariant) level. However there have been several advancements in modeling interpersonal behavior over time and some of these methods may be usefully leveraged to evaluate interpersonal behavior in a dynamic (time-varying) way. Interpersonal theory has been applied to time-varying behavior in the laboratory as well as in the daily lives of patients. The former typically employs a laboratory based interaction task (with strangers or confederates), in which the participants’ interpersonal behavior is coded and evaluated by a trained observer on a second-to-second level (see Sadler, Ethier, Gunn, Duong, & Woody, 2009). Recently, Thomas and colleagues (under review) applied this coding method to the Gloria psychotherapy tapes, demonstrating the usefulness of coding therapy sessions to examine cyclical patterns of interpersonal processes, the attunement of interpersonal patterns among two individuals, whether the interpersonal patterns become more stable or dynamic, and how each person’s behavior influences each other. Such an approach holds considerable promise for understanding the second-to-second interpersonal dynamics occurring within a prescribed setting such as a therapy session. Yet, much of the patient’s interpersonal difficulties are experienced outside of session, and such second-to-second evaluations of interpersonal behavior would be difficult to gather when the patient is not in the therapy room (but see Holtzman, Vazire, & Mehl, 2010). Another method is to collect brief self-report surveys of the patient’s interpersonal experiences across a variety of occasions and relational contexts. This approach is termed intensive repeated measurements in naturalistic setting (IRM-NS; Moskowitz, Russell, Sadikaj, & Sutton, 2009), and is typically implemented by asking the participant to record their interpersonal experiences after an interaction lasting at least five minutes (event-contingent recording). Such approaches are particularly useful for assessing interpersonal dynamics because they can focus assessment on interpersonal exchanges as they occur in that patient’s daily life. The present paper focuses on IRM-NS, and how it can be applied to help the clinician better understand a single patient. To begin, principles of contemporary interpersonal theory is reviewed, focusing on the assumptions of how interpersonal processes unfold. I review research findings that support such principles in IRM-NS studies, then describe the data-collection method for our single patient, and demonstrate the methods developed to examine the patient’s interpersonal experiences and its relationship to his self-reported functioning. At a conceptual level, contemporary interpersonal theory suggests that the most important things in life we experience are interpersonal in nature (Pincus, Lukowitsky, & Wright, 2010). These interpersonal experiences can be organized based on the two meta-constructs of agency (e.g. mastery, assertion) and communion (e.g. to belong, connect, share with others). These meta-constructs can be represented at the behavioral level (to dominate vs. to submit; to be friendly vs. to be cold), as well as at the level of interpersonal perception (to perceive dominance vs. submissiveness in others; to perceive friendliness vs. coldness in others). Interpersonal theory suggests that perceiving an interaction partner as dominant tends to invite one to respond with submissiveness (agentic complementarity) while perceiving an interaction partner as friendly tends to invite one to reciprocate with friendliness (communal complementarity). Naturalistic longitudinal studies have generally confirmed these patterns of complementarity (Fournier, Moskowitz, & Zuroff, 2009; Moskowitz, Ringo Ho, and Turcotte-Tremblay, 2007; Roche, Pincus, Conroy, Hyde, & Ram, in press). Another consideration is how agentic and communal experiences go together. Agency and communion are commonly regarded as orthogonal (uncorrelated) dimensions, however, Fournier and colleagues (2009) found that the within-person association of agentic and communal behavior is not orthogonal for many individuals, and between-person differences in these associations relate to adjustment. Within-person association of agentic and communal perceptions are also not orthogonal for many, and individual differences in these perceptions are associated with distinct types of personality pathology (Roche, Pincus, Hyde, Conroy, & Ram, in press). Thus complementarity and covariation are useful interpersonal processes that organize how dynamic interpersonal exchanges and experiences are structured. Clinicians can certainly be informed by research that articulates how patients or student samples organize their interpersonal processes generally, yet the clinician is likely most concerned with how their patient structures their interpersonal exchanges and experiences, as well as how that structure relates to that patient’s functioning. This project aims to articulate the methods and statistical analyses most useful in summarizing a single patient’s interpersonal processes to demonstrate the usefulness of collecting person-specific longitudinal data for clinical purposes. Participants and Procedure. The participant is one of 10 participants recruited for a clinical IRM-NS pilot study. He attended a 1.5 hour training session where he learned how to answer the self-report questions and was introduced to the smartphone he was given to complete his responses. He also had access to a 24-hour helpline, which he could call in case of an errant response or confusion. Since this was a pilot study, clearance to view his clinical records and diagnosis were not obtained and cannot be reported here. He was 49 years old, male, married, and was currently receiving treatment at the local psychological clinic. He reported 136 social interactions (face-to-face interactions that lasted at least five minutes) over a 21-day period. Although the primary focus is evaluating him, part of this will also include examining the extent of agreement between his and his wife’s reports throughout the study (as she was concurrently enrolled in the study). Specifically I considered the reports in which both husband and wife reported on the same interaction (n=85), determined through interactions where they both reported interacting with their spouse, and the ratings for each were completed within 10 minutes of each other. Figure 1. An event contingent recording survey to assess interpersonal dynamics in daily life. Measures. The participant (and his wife) used a smartphone with a pre-programmed survey application to record his responses. All dimensional responses (0-100) were reported by selecting a point along a touch point continuum (see Figure 1), where he rated his own behaviors, his perception of his interaction partner, and his reaction to that interaction (e.g. anger, self-esteem). Using a simple correlation between how he perceived others agency and his own reported agentic behavior, there was evidence for agentic complementarity (r= -.54, p<.05) across his 136 interactions (see top left of Figure 2). Figure 2. Plots and moderators of interpersonal complementarity. Agentic complementarity (top left), communal complementarity (top right), and the moderating effect of self-esteem on agentic complementarity (bottom left). Dots on the top figures represent the raw (0-100) scores the participant reported. 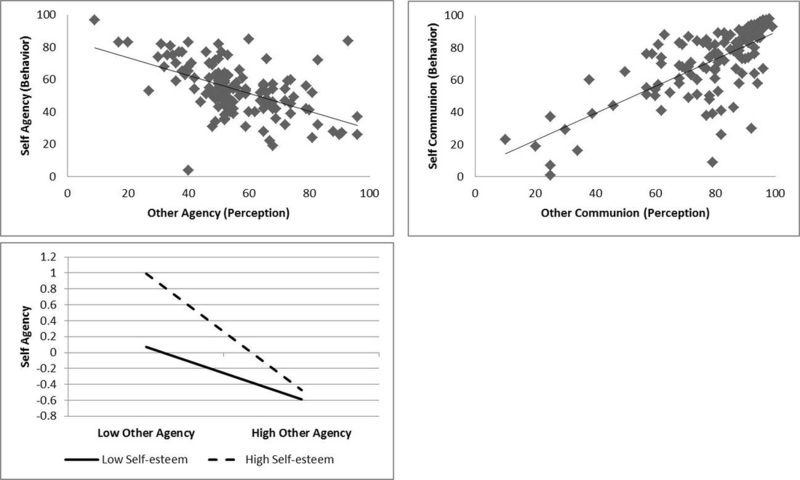 Low/High scores for other agency and self-esteem calculated as -/+ 1 standard deviation from the sample centered average. Sample based on 136 observations reported by the husband. I next explored how complementarity concurrently impacted his functioning by constructing a hierarchical linear model, where his agentic behavior was predicted by his perception of agency, as well as self-esteem, anger, and the interaction of these functioning variables with agentic perception (see Table 1). There was a significant interaction, indicating that during social interactions with lower agentic complementary (e.g. weaker negative association between his agentic perception and behavior), he experiences lower self-esteem (see bottom of Figure 2). I further explored these effects by coding his interactions by whether he perceived himself in a dominant (his agentic behavior score was greater than his perception of his partner’s agency, n=62) or submissive position (n=71). After recalculating his agentic complementarity correlations in these two subsets of interactions, correlation coefficients were compared. When he was in the more dominant position, agentic complementarity remained (r= -.46, p<.05) but when he was in the less dominant position, agentic complementarity was not found (r=.02, p>.05, rdiff = .48, Z=2.94, p<.05). In other words, he was much more likely to engage in agentic complementarity when he was in the dominant role, and this might point to difficulties or conflicts with relying on, deferring to, or cooperating with others. The same analyses were conducted for communion, finding that he also reported complementarity on the dimension of communion (r= .71, p<.05, right side of Figure 2), but anger and self-esteem did not moderate this association. Next interpersonal covariation is considered. The top left of Figure 3 demonstrates that he perceived agency in others as unfriendly (r=-.51, p<.05), but associated his own agentic behavior as friendly (r=.38, p<.05). This suggests the participant has a core interpersonal schema where he tends to perceive other’s dominance as cold, yet he reports his own dominant behavior as warm. I then explored how covariation concurrently impacted his functioning using the same approach described for complementarity (and see Table 1). 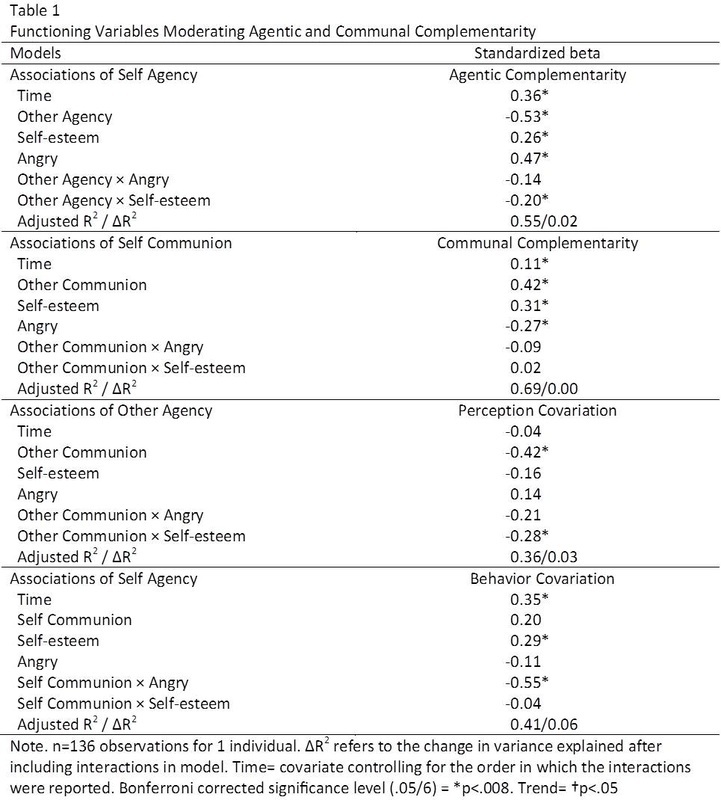 During interactions where he perceives dominance and coldness are more strongly linked, he also reports higher self-esteem, but no significant association with anger (see Table 1, bottom left of Figure 3). During interactions where he tends to behave dominant and unfriendly he reports higher anger and no significant association with self-esteem (see Table 1, bottom right of Figure 3). Thus the type of covariation (perception, behavior) had differential impact on his functioning (self-esteem, anger). Figure 3. Plots and moderators of interpersonal covariation. Covariation of interpersonal perception (top left), covariation of interpersonal behavior (top right), moderator of perception (bottom left) and behavior (bottom right). Dots on the top figures represent the raw (0-100) scores the participant reported. Low/High scores calculated as -/+ 1 standard deviation from the sample centered average. Sample based on 136 observations reported by the husband. To evaluate him further, the 85 interactions where he and his spouse both completed records of their interpersonal exchanges is considered. To start, correlations between his reported agentic behavior with his wife’s perception of his agentic behavior were computed, finding modest agreement (r=.29, p<.05) between the two (see Figure 4). Figure 4. Husband and Wife agreement on his agentic behavior. Agreement of husband’s behavior on agency (top left) and the moderators of agreement (bottom). Dots on the top figures represent the raw (0-100) scores the participants reported during the same interaction. Positive slope indicates agreement between wife (horizontal axis) and husband (vertical axis) on his behavior. Low/High scores calculated as -/+ 1 standard deviation from the sample centered average. Sample based on 85 observations reported on by both husband and wife. 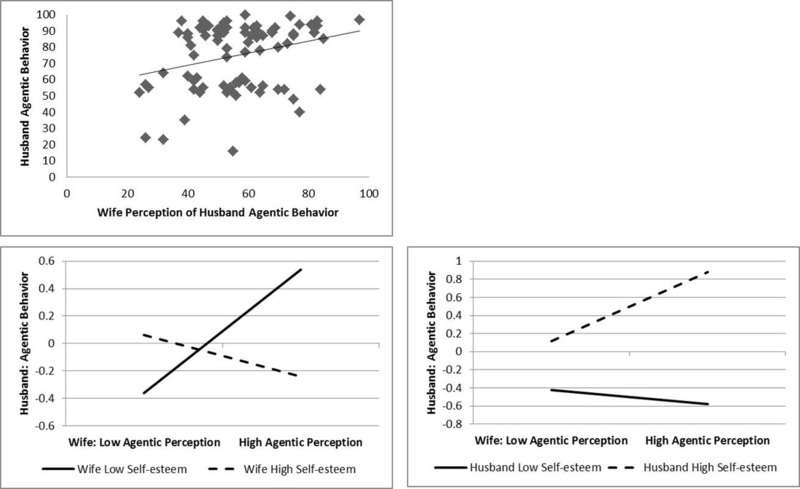 Next a hierarchical linear model was constructed, where his agentic behavior was predicted by the wife’s perception of his agency (forming an agreement parameter), his and her self-esteem and anger, as well as interactions between self-esteem, anger, and agreement for both husband and wife (see Table 2). Constructing the model in this way allows us to concurrently evaluate what aspects of functioning (self-esteem, anger) are impacted, and who (husband, wife) is impacted by such disagreement over his agentic behavior. Significant main effects suggested that when he reports behaving with higher agency, he also tends to be feeling higher self-esteem and more anger. There were two marginal effects (p<.05, but not below the bonferroni corrected significant level), impacting both the husband and wife (see Figure 4). When there is greater agreement on his agentic behavior (i.e. positive slope), the wife tends to experience lower self-esteem, but he tends to experience higher self-esteem. 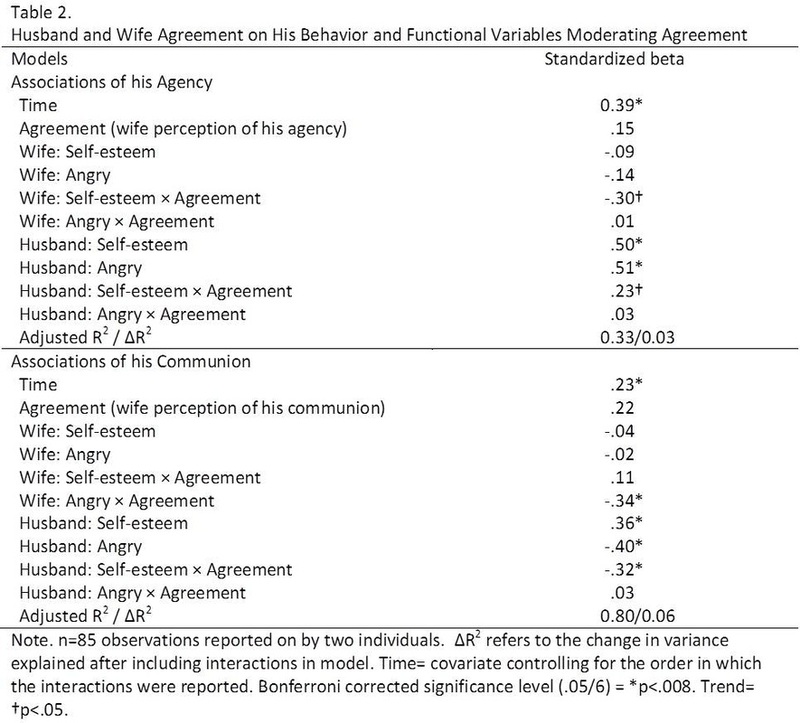 Next, his communal behavior was associated with his wife’s perception of his communal behavior, finding stronger agreement (r=.65, p<.05, Figure 5). Similar to before, a regression model was built to evaluate the impact of agreement on husband and wife functioning (Table 2). 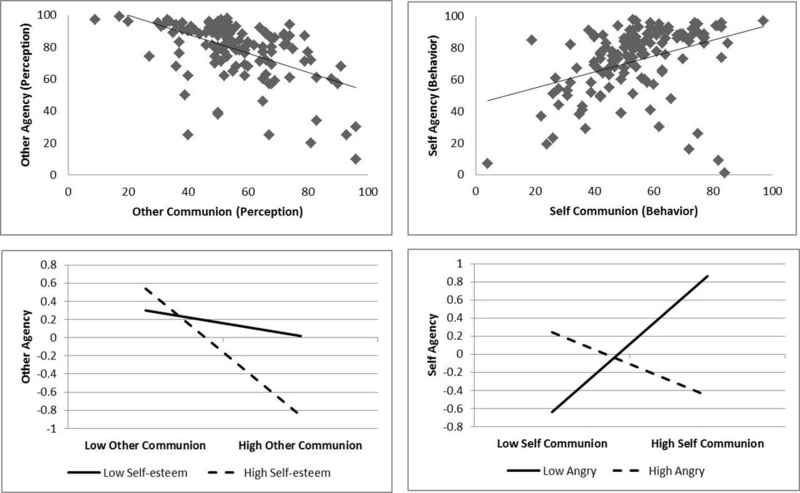 Significant main effects suggested that when he reports behaving with higher communion; he also tends to be feeling higher self-esteem and lower anger. Again there were significant interactions for both husband and wife. 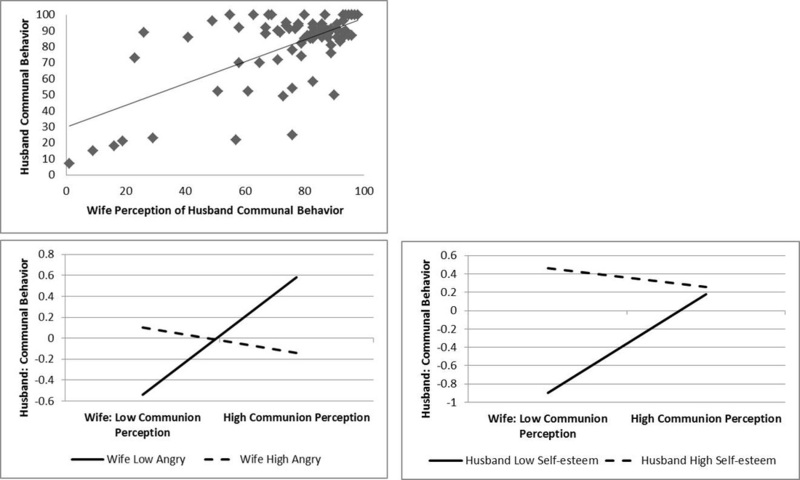 Lower agreement on his communion was associated with his wife reporting more anger, but the husband reporting higher self-esteem (Figure 5). Thus, both the husband and wife were impacted by the extent to which they saw eye to eye on his interpersonal behavior. Figure 5. Husband and Wife agreement on his communal behavior. Agreement of husband’s behavior on communion (top left) and the moderators of agreement (bottom). Dots on the top figures represent the raw (0-100) scores the participants reported during the same interaction. Positive slope indicates agreement between wife (horizontal axis) and husband (vertical axis) on his behavior. Low/High scores calculated as -/+ 1 standard deviation from the sample centered average. Sample based on 85 observations reported on by both husband and wife. Together these analyses build an interpersonal landscape of how an individual typically experiences others, and how interpersonal experiences impact his (and her) functioning. This participant engaged in both agentic and communal complementarity. At a molar level, adherence to complementarity may be indicative of normal interpersonal functioning. Deviations from agentic complementarity impacted his self-esteem, but deviations from communal complementarity did not. This may suggest an underlying sensitivity regarding agency. Consistent with this, agentic complementarity was only present when he was in the dominant position. The behavior covariation score suggested he experiences more anger when he tends to behave with dominance and unfriendliness (or submissiveness and friendliness). It could be that behaving dominant and unfriendly is his way of discharging anger. Alternatively, this result could be capturing experiences of anger and frustration when behaving in a friendly submissive way towards others (rather than being able to express dominance with them). The participant endorsed higher self-esteem when perceiving dominance and unfriendliness (or submissiveness and friendliness) as linked. In other words, he experiences a positive self-image when he perceives another as agreeing with him (submissive/friendly) or perceiving their dominance as somehow also unfriendly. Perhaps the tendency to link perceptions of others’ dominance with unfriendliness is why he is unwilling to engage in complementarity when in the submissive position. Agreement on his agentic behavior is modest between himself and his wife. When they agree, he tends to experience higher self-esteem, and she tends to experience lower self-esteem. In other words, when she is recognizing his agency he feels satisfied and fulfilled, while she experiences the opposite feeling. This finding potentially highlights a source of conflict within their relationship which they could choose to explore further. Agreement on his communal behavior is stronger (compared to agreement on agentic behavior). Disagreement on his communal behavior tended to be associated with her experiencing more anger, and him experiencing higher self-esteem. This finding might suggest a bias in which he perceives himself to be friendlier than she sees him. Viewing himself this way bolsters his self-esteem, but leaves her feeling angry. Linked with the other information, it is possible he is motivated to report that he behaves both friendly and dominant (behavior covariation), but disagreement over how “friendly” he is enacting his dominance may lead to interpersonal conflicts with those close to him. This is also consistent with his unwillingness to complement another’s agency when he is put into the submissive position and the experience of anger during interactions when he is behaving friendly and submissive. Together, it appears his interpersonal exchanges and experiences are characterized by a complex theme of agentic strivings and reactions to those needs not being met. This type of analysis allows clinicians to see how the dynamics of interpersonal dysfunction occurs naturally in their patient’s daily life. It can uncover whether the patient generally engages in complementary social exchanges, and can zoom in to uncover the particular contexts (e.g. dominant position) where this pattern deviates. This is clinically quite useful for identifying focal problems, targeting therapeutic interventions, and strengthening interpretations by drawing from the existing data the patient provides. However, this approach is limited by the patient’s ability to accurately self-report and potential effects due to self-monitoring as the patient continues to complete the assessments. The data is also limited by the interactions the patient chooses to report, and potentially meaningful exchanges could be lost if the interaction did not last the required 5 minute duration to be reported. The final limitation addressed is the lack of a normative sample with which to compare these person-specific associations. For example, the patient’s agentic complementarity was associated with self-esteem, but it could be that most people also have this association, making this significant finding normative. It would mean this association does not distinguish this patient from others. However, if the concern of the clinician is how the patient links their interpersonal processes to their functioning, and not how different these patterns are compared to others, the person-specific approach still has clinical utility. The most effective analysis would combine both approaches which could inform the clinician of their patient’s patterns, and how rare these patterns are. Benjamin, L.S. (2000). Intrex user’s manual. Salt Lake City: University of Utah. Dawood, S. Thomas, K.M., Wright, A.G.C., & Hopwood, C.J. (in press). Heterogeneity of interpersonal problems among depressed young adults: Associations with substance abuse and pathological personality traits. Journal of Personality Assessment. Fournier, M. A., Moskowitz, D. S., & Zuroff, D. C. (2009). The interpersonal signature. Journal of Research in Personality, 43, 155-162. Holtzman, N.S., Vazire, S., & Mehl, M.R. (2010). Sounds like a narcissist: Behavioral manifestations of narcissism in everyday life. Journal of Research in Personality, 44, 478-484. Moskowitz, D.S., Ringo Ho, M., & Turcotte-Tremblay, A. (2007). Contextual influences on interpersonal complementarity. Personality and Social Psychology Bulletin, 33, 1051-1063. Moskowitz, D. S., Russell, J. J., Sadikaj, G., & Sutton, R. (2009). Measuring people intensively. Canadian Psychology, 50, 131–140. Pincus, A.L., & Gurtman, M.B. (2003). Interpersonal assessment. In J.S. Wiggins, Paradigms of Personality Assessment (pp. 246-261). New York: Guilford. Pincus, A.L., Lukowitsky, M.R., & Wright, A.G.C. (2010). The interpersonal nexus of personality and psychopathology. In T. Millon, R. Kreuger, & E. Simonsen (Eds. ), Contemporary directions in psychopathology: Scientific foundations for DSM-V and ICD-11 (pp. 523-552). New York: Guilford. Roche, M.J., Pincus, A.L. Conroy, D.E., Hyde, A.L., & Ram, N. (in press). Pathological narcissism and interpersonal behavior in daily life. Personality Disorders: Theory, Research, & Treatment. Roche, M.J., Pincus, A.L. Hyde, A.L., Conroy, D.E., & Ram, N. (in press). Within-person Covariation of Agentic and Communal Perceptions: Implications for Interpersonal Theory and Assessment. Journal of Research in Personality. Sadler, P., Ethier, N., Gunn, G.R., Duong, D., & Woody, E. (2009). Are we on the same wavelength? Interpersonal complementarity as shared cyclical patterns during interactions. Journal of Personality and Social Psychology, 97, 1005-1020. Salzer, S., Leibing, E., Jakobsen, T., Rudolf, G., Brockmann, J., Eckert, J., Huber, D., Klug, G.,Henrich, G., Grande, T., Keller, W., Kreische, R., Biskup, J., Staats, H., Warwas, J., & Leichsenring, F. (2010). Patterns of interpersonal problems and their improvement in depressive and anxious patients treated with psychoanalytic therapy. Bulletin of the Menninger Clinic, 74, 283-300. Thomas, K.T., Hopwood, C.J., Ethier, N., Sadler, P., (under review). Momentary Assessment of Interpersonal Process in Psychotherapy. Journal of Clinical Psychology. Wright, A.G.C. & Pincus, A.L. (2011, March). The interpersonal profiles of narcissism. Paper presented as part of the symposium. Further advances in the assessment of pathological narcissism. M.R. Lukowitsky (chair). Society for Personality Assessment annual meeting, Cambridge, MA. Wright, A.G.C., Pincus, A.L., Conroy, D.E., & Hilsenroth, M.J. (2009). Integrating methods to optimize circumplex description and comparison of groups. Journal of Personality Assessment, 91, 311-322.